Philip Brandes in the Bravus Brewing Compny facility in Santa Ana. 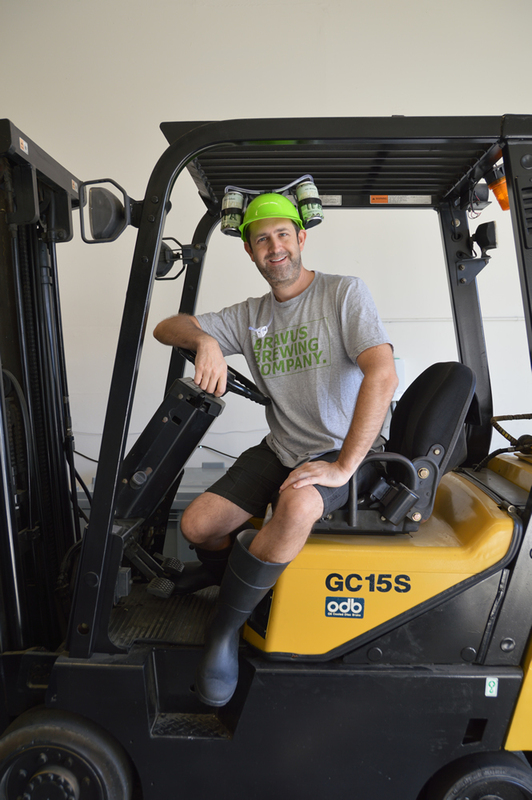 When Philip Brandes began teaching himself to make beer in his garage, he had a specific goal in mind in 2014. Make a really good tasting craft beer with an alcohol content of .5 percent or less. “I spent lots of money on Ebay and threw out lots of beer,” he said. “I decided to keep moving forward,” he said. The result was the Bravus Brewing Company. Initially, he read a lot of research papers about the beer making process and he sought the counsel of a Canadian microbiologist he met online who had done her thesis work on yeast. “Yeast is a living thing,” Brandes said noting that it took 50 to 100 batches to learn to brew a good beer consistently. After experimenting with different hops, grains and yeasts, Brandes found a yeast that didn’t produce very much alcohol and he learned to go “slow and low” during the fermentation process, which also helped reduce the alcohol in his finished product. Using his background as a programmer, Brandes developed an app to check on the temperatures in his fermentation tanks. “You need to see what’s going on,” he said. So in addition to the device that monitors conditions in the tanks, Brandes also had glass windows built into his stainless steel tanks. “When customers try our IPA they become instant fans. In fact, the majority of them cannot believe it’s non-alcoholic,” he said. “I’m not sure I’m making any money yet, but my inbox is filled with thank-yous,” he added. The market for non-alcoholic beer has mostly consisted of people in recovery, pregnant women, designated drivers and those that choose not to drink for religious reasons. Brandes and Bravus’ director of sales and marketing Cathryn Kruger aim to expand the market. “Everyone knows someone who doesn’t drink,” Kruger said. And people with a taste for craft beer “may not want the responsibility of alcohol in a particular situation,” such as an employee lunch meeting or a kid’s sporting event. Because the beer is non-alcoholic, it also can be shipped anywhere, making online sales a significant part of Bravus’ business. A six pack purchased on line goes for $12 plus $12 for shipping. For the last seven months, 150 to 200 cases of Bravus India Pale Ale have been going out the door of Brandes’ Santa Ana production facility. Locally the Bravus IPA is served at The Cliff, Montage, Koffee Klatch and Maro Wood Grill, plus seven other Orange County restaurants and liquor stores. Kruger and Brandes make deliveries themselves. Bravus plans to introduce two new beers soon, a dark stout and one, which will be called CaliforN/A Red. The company is also looking for a larger facility to boost production. Currently, the company outsources packaging and their canner brings his equipment to the Santa Ana facility. Brandes says he’d like to bring some of those services in house. Labile plans to brew beer to compliment the restaurant’s authentic, regional Mexican dishes. “Currently we have four people in the running to be our brew master,” he said. His plans call for their “own lager, a stout and beers with sour peach and guava flavors.” On tap, the Grille already offers some Mexican craft beers and Greeter’s Ale from the Laguna Beach Beer Company. Laguna Beach Beer Co. in 2014 after perfecting their pale ale, which they named Greeter’s Ale for Laguna’s series of greeters. The partners now produce three other beers, Canyon Road Red, the blonde ale Second Reef, and Thousand Steps IPA, also named after local locations. Eight months ago they moved in to a location in Rancho Santa Margarita previously known as the Cristamonte Brewing Company. The 3,100 square foot facility at 29851 Aventura includes a 1,000 square foot tasting room with an outdoor patio where flatbreads and other snacks are served along with the beer. Although the 15-barrel brew house can turn out over 5,000 barrels of beer per year, Reynard and Lombardo have already expanded into an adjoining 1,500 square feet space. Now, the brewers are “actively pursuing” a location to open a Laguna Beach brewery and tasting room, Reynard said. “We plan to have all styles of beer, including barrel aged,” he added. They envision a family friendly environment with a wood-fired oven producing tasty flatbreads, hopefully as early as next spring.